An unacknowleged classic, The Grifters is a neo-noir of the highest order. For my tastes, it is the best noir I have seen, with Double Indemnity (1944) a close second. The film is based on the novel, The Grifters, by legendary pulp crime fiction novelist Jim Thompson. John Cusack, Anjelica Huston and Annette Bening take you on a journey you will never forget. The casting here is absolutely superb. Highly-respected supporting actors such as Pat Hingle, J.T. Walsh and Charles Napier flesh out the terrific screenplay even further. Stephen Frears had just finished directing the wonderful Dangerous Liaisons (1988) when Martin Scorsese approached him and told him he was producing a new movie and wanted Frears to direct. The rest should be the stuff of legend. Hopefully, one day, The Grifters will be listed as a classic. It deserves it. As always, we recommend you don’t ruin any surprises by reading spoilers or watching trailers. The following trailer, as usual, gives away too much. Hi, if you are looking for dark urban films superbly directed and acted with a great script then I can recommend Biutiful starring Javier Bardem. His best yet fabulous! Excellent movie – stylish, cold noir. Is financial crime a main element of this film’s plot? If so, I’ll check it out. I noticed Anjelica Huston fondling the suitcase of cash, but sometimes trailers are a tease that make me think it’s going to be about robbery, bribery, fraud, etc., only to find out that’s a minor part or side angle of the story. Watching it on Netflix right now. I love skeevy L.A. period pieces. Did not realize Westlake wrote the script. Presumably with his Richard Stark hat on, given the storyline. 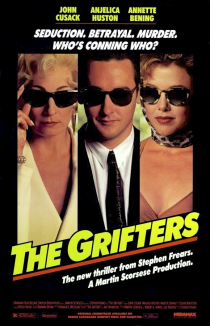 No one I know has seen The Grifters so I watch in alone, over and over and over again. It it one of my favorites from the late 80’s/early 90’s along with The Vampires Kiss with Nicolas Cage. If you like neo-Noir and haven’t seen it yet, I highly recommend Brick. It was quite the education to watch John Cusack pulling off all his little scams. And Anjelica Huston’s scornful ‘I’ve never had a legit job in my LIFE!’ was a classic line. And Annette Bening. What a babe she was back then. I love this movie. It is on my list of all-time greats. John Cusack, Annette Bening and Anjelica Huston turn in perfect performances. Stephen Frears is one of the few directors to create a film that could honestly be called Hitchcockian. The only sad thing about that is that no one is even trying today. At least, with the kind of budget it would take to do such in today’s dollars. If you are looking for movies to review, I can think of a number of my favs: Office Space, A Fish Called Wanda, Cinema Paradiso, My Father’s Glory, My Mother’s Castle, North Face, Lion in Winter. All wonderful films that should be on anybody’s list. Why oh why is this film not held in the same high regard as so many lesser productions? It is simply sublime, with a cast that does not put a foot wrong in any scene. Cusack’s best ever performance, Huston at her melancholic finest. Thanks for including this one Shimky.